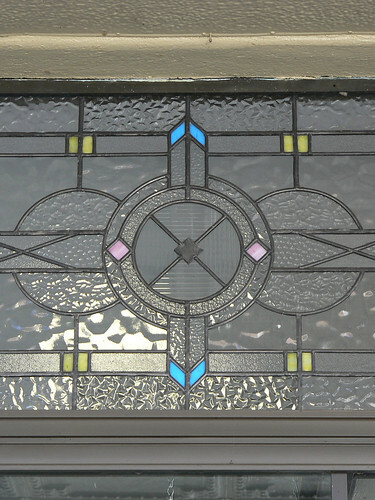 A series of leadlight window just like this one are tucked in under the verandah 103-107 Pine Avenue, Leeton. Leeton was first developed as part of the Murrumbidgee Irrigation Area or the MIA in the early part of the 20th Century so many of the buildings date from that period and many have Art Deco features. 103-107 Pine Avenue was built in 1928 for the local newspaper and it still occupies No 107. And I think it has one of the best names for a newspaper that I have ever heard ... 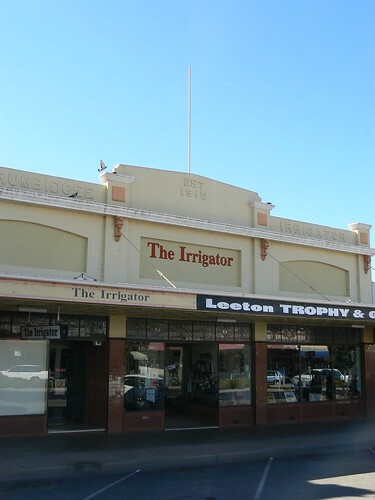 The Murrumbidgee Irrigator. What a terrific idea - the Art Deco Walking Tour Booklet, created I am assuming specially for the Leeton Art Deco Festival. We found an Art Deco Walking Tour Booklet in Mildura and loved it. Spot on Helen! Robin conducted 5 walks (I think) over the weekend with about 30 people on each so it was very popular with a good mixture of blow-ins, like me, and locals learning about their town and recalling former buildings and former uses of current buildings. By the time I did the walk (Robin's 3rd) he was already incorporating local ancedotes and references. I have heard of the Mildura walk and it is on my ever expanding list! Thanks Jason. I downloaded that heritage booklet before I went to Leeton and then picked up a printed copy at the Art Deco Festival. 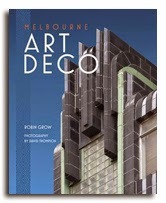 It's a great booklet covering more than just the deco era.